An office refurbishment may seem like an extravagance, but refurbishing your office can make a big difference to your business. Flexible working, bonuses and drinks down the pub all play their part in winning over your team but what really makes the difference to productivity day in day out is having a nice place to work. Giving your office a fresh new look is a clear indication to your team that they are valued and you are happy to invest in improving their environment. Plus it makes more efficient use of office space and creates a great first impression for your clients and prospects. Arranging a consultation with an office design and refurbishment specialist is usually the first step in the process. This is the point at which at Trevor Blake, we would ask you about the size of your business, your organisational culture, the nature of your workflow and how much flexible working and collaboration needs to be designed for. We have a checklist of questions that we ask so you don't need to worry about not giving us the information we need, we'll walk you through it, leaving nothing to question. The design and layout for your office refurbishment can be brought to life with 3D CAD visualisation. These are so realistic, you'll have trouble telling the difference between the CAD and the real thing! Even though they cost a bit extra, they are invaluable in helping to gather buy-in and agreement from the key project stakeholders. Office flooring - time to throw out that tired navy blue carpet? Change to a brightly coloured carpet or luxury vinyl flooring which is easy to clean? Suspended ceilings hide wires and pipes as well saving heat. Power and data can be serviced directly from the ceiling if they cannot be easily accessed from the floor. Office lighting ? having access to natural light is important, an office refurbishment can encourage more natural light or replicate it in areas that have no windows. 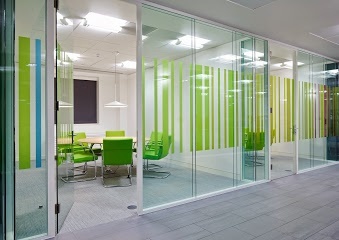 Office partitioning - ideal for creating private areas and reducing noise levels in an open plan office. Glass partitioning is particularly effective in retaining the benefits of an open plan office layout and giving a modern and spacious feel to the office. Office furniture ? The furniture and decor of an office makes a world of difference to the finished result. Contemporary furniture turns an office into a warm inviting place and can really add the wow factor! Data and IT - in most offices there is a vast amount of electrical equipment; computers, photocopiers, telephones and faxes. So wiring needs to be correctly installed and workstations placed near power outlets. Office temperature - The HSE state that the temperature should be at least 16 degrees Celsius in an office where people work sitting down. So, different types of heating, ventilation and air conditioning need to be considered.